June 27, 1990, is a significant date in the recent history of Mali. It marks the beginning of what Malians call "The Second Tuareg Rebellion." The first had been staged against the post-colonial Malian government in 1963. The national government had suppressed that rebellion with harsh coercive measures, and the Tuaregs continued to nurture grievances. The second Tuareg rebellion coincided in the early 1990s with turbulent political developments in Malian society as a whole. It soon was clear that Mali's stability and progress were contingent on ending the insurgency. This, in turn, required a solution to Tuareg grievances. 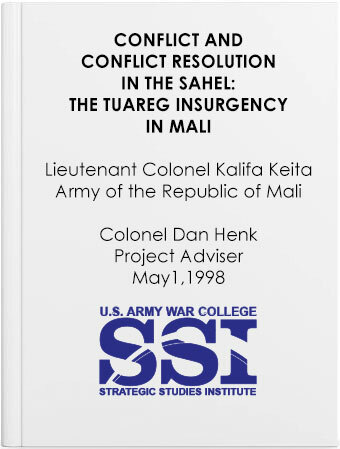 By the mid-1990s, Mali apparently had found a solution. Though by no means easy, or assured, that solution may provide useful insights into conflict resolution in the region as a whole. This study describes the nature of the Malian solution and indicates the reasons for its success to date. More specifically, this study considers the Tuareg rebellion from the perspective of a senior Malian military officer who lived the events. It describes a conflict little known and poorly reported outside of West Africa. It emphasizes the trauma of conflict in developing societies and the excruciatingly difficult political and economic choices faced by their leaders. It highlights the appropriate role of the international community in resolving such conflicts. Finally, it illustrates that resolution of intra-state conflict in Africa requires intensive efforts to secure the willing cooperation of local communities with military and civil government agencies.